Family Dogs and growing babies....life, lessons and love! : Say Cheese! 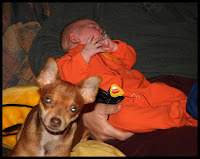 We have a natural desire to see our dog with our new baby. This creates the image of harmony we are looking for in a long term bond. It is the family photo we all want and who can resist! Do your dog and baby a favor by making sure that an adult is included and holding the baby to help make this a safe and comfortable encounter for all. This will allow for wonderful photos. Dogs feel more comfortable when an adult is included and the baby is in their arms. This dog is unsure.